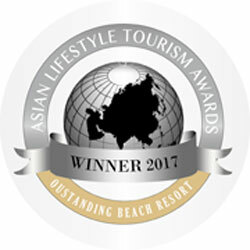 (Nusa Dua, October 2017) Samabe Bali Suites & Villas is delighted to announce that achieved one of the prestigious awards and honored as the Outstanding Beach Resort 2017 by Asian Lifestyle Tourism Awards 2017. With scenic beach and the Indian Ocean view, well-appointed suites & villas and a comprehensive array of amenities, activities and facilities, it is truly an honor for Samabe Bali Suites & Villas to be recognized and come out on top of the list in the category of the Outstanding Beach Resort. “We are very proud to receive this international recognition from the Asia Lifestyle Tourism Awards 2017. It is represent our resort towards our commitment which offering luxury service and facility to every guests and it would not have been possible without the real effort, passion and dedication from our staffs”, remarked General Manager Samabe Bali Suites & Villas, Ralf Luthe. Asia Lifestyle Tourism Awards is reflect, promotes and develop the tourism destination by providing all luxury hotel and resorts with recognition for their excellent facilities and services. This award is being organized with inclusion of more than 1000 distinguished Lifestyle Tourism destination in Asian region.